I reluctantly became a grocery shopping coupon “expert” a few years ago when I made a bet with my sister and told her that I I thought I could eat well only spending $1 a day for food. I managed to succeed doing it through the use of coupons, but I never really enjoyed the effort it took to gather, cut and sort all of them. I continue to greatly dislike most aspects of couponing to this day (while it can definitely save money, it’s just not how I want to spend the free time I have), but there is one aspect of what I learned which I still take advantage of when I do go shopping. That is using the coupons which can be found inside the grocery store. While most people get their coupons from the Sunday paper or print them online from sites like this, for those that don’t like to do a lot of clipping or printing, you can still save a bit of money with in-store coupons. “Blinkies” are coupon machines from the SmartSource coupon company (pictured above). They get their name because of a small red light on the side of the machine that blinks and is supposed to attract the attention of passing consumers. These coupon machines are usually placed directly in front of the product for which the coupon is good, and they can be used for the purchase you are going to make right then and there. You can usually take two coupons, and then the machine will go into a “delay mode” where it will only spit out another coupon every minute or so. This is to keep people from taking all the coupons in the machine, and it’s usually considered poor coupon behavior to take more than a few each visit. The one exception is when the coupons from the machine have been left by others. There is usually a slot on the top of the blinkie machine where people who take out a coupon, but decide they don’t want it, can replace it back if they aren’t going to use it. The coupons in this “return slot” are usually considered free for anyone to take no matter how many are there. You can also usually find a few scattered on the floor from people who simply dropped them and these are also considered free to take by anyone. Blinkie coupons are standard manufacturer coupons and are good until the expiration date on the coupon, so they can be used at a later date as well. Peelies are so-called because they are coupons which must be peeled off the product packaging. They are standard manufacturer coupons which are found attached directly to the product. These coupons often have words like “use me now” on them, and they can often say that the store clerk must remove them to be valid. The problem with these coupons is that they can often be missed when the product is being scanned at the register, so if I find one on something that I’m buying, I usually separate that product from the rest of what is in my cart so I don’t forget to tell the cashier to peel it off and claim the discount at check-out. These are by far my favorite type of coupon. Catalina coupons are often called “check-out coupons” and they’re from the Catalina Category Marketing (CCM) company. These coupons are usually triggered by what you purchase, are dispensed from a small machine next to the register, and are given to you by the cashier with your receipt. There are actually two types of catalina coupons. The first is a standard manufacturer coupon which is good for up to three months from when you receive it. These are often high value coupons worth more than the coupons you can typically find in your Sunday paper or online, and sometimes they are for a free product. Catalina coupons can often be for a competing product of something that you have just purchased. For example, if you buy Ben & Jerry’s ice cream, you may get a catalina coupon for Haagen Dazs ice cream. The second type of catalina coupon is a certain dollar amount off on your next purchase at the store which is good on anything you buy. These are triggered when you purchase a certain number of a particular product being promoted, and there is usually a 2 week period for which this coupon is good. While you get these when you check out, they’re often easy to find around the store. Many people leave them in their shopping carts and throw them away in the trash cans near the grocery store exits. They can also often be found in the self check-out lines where people simply leave them. Since catalina coupons are usually high value and some can be used the same as cash, I always check extra carefully for these whenever I go shopping. By doing so, I usually get about $100 in free product from them each year. Freezer extras are located in the freezer and refrigerated sections of the grocery store. They are usually plastic holders that are either clear so you can see the coupons, or in bright colors to attract attention. The coupons are usually for products found directly behind the refrigerated doors where they are placed. These are usually standard manufacturer coupons which are good until the expiration date printed on them. TakeOne boxes are dispensers which are most often located on grocery store shelves near eye level of the product they are promoting. These don’t always contain coupons. They will often have recipes, product information, rebates, sweepstakes offers and other promotional material instead of coupons, but they are worth checking because they also may contain standard manufacturer coupons. Showcase Extras are coupon holders made by SmartSource which are attached to the shelf-bracket close to the product it’s advertising. 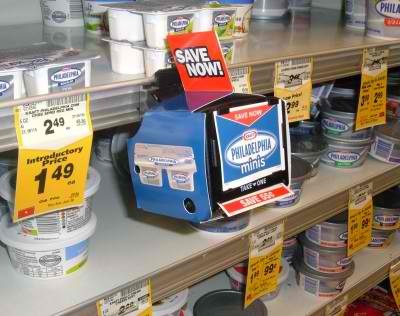 They usually have a “riser card” which sticks out from the holder into the aisle to grab the consumer’s attention. These usually contain information that highlight new product features, and many times have a manufacturer coupon or some other type of product incentive at the bottom of this information. Tear pads are exactly what they sound like. They are a pad of several hundred manufacturer coupons where the consumer can simply tear the coupons from the pad. While these are often found near the product that they are promoting, they may also be found near products that go well with one another. For example, you may find a tear pad of salsa coupons near the tortilla chips. While tear pads often contain hundreds of coupons, it’s usually considered poor coupon behavior to take more than a few so that everyone can have a chance to take advantage of them. Wine tags and collars are standard manufacturer coupons that can be found around the neck of some type bottle or jar. As would be expected, wine tags can be found around the necks of bottles of wine or other alcoholic beverages. Collars are coupons which can be found around the necks on such products as olive oil, juice, salad dressing, or any other type of jar. While these coupons are often for the product that they are hanging on, they are sometimes for products that compliment the product on which they are found. For example, a wine tag coupon might be for a particular brand of cheese that goes well with it. Manufacturer brochures are often found in special end-aisle or in-aisle stand-alone product displays (they are often found on the side of the cardboard display). The brochure usually has product information, recipes and other promotional material for the product featured in the display. There are also often manufacturer coupons near the bottom or on the back of these brochures for the product being promoted, and sometimes for other products which compliment or go well with it. Grocery stores will sometimes have small brochures or pamphlets about products that they are carrying that the store created as opposed to the manufacturer of the product. In addition to product information, they will sometimes contain store coupons. These differ from manufacturer coupons as they are only good at that particular grocery store. The nice thing about these coupons is that they can often be used in addition to a manufacturer coupon on the same product giving you the potential of some great savings. These are far less common than manufacturer coupons, but they’re highly prized if you come across them. These are just some of the places that you can find coupons within the grocery store. If you have never noticed coupons in store before, take the time on your next trip to look for them. I think you will be surprised at how many there really are. For a lot of people, Target is their go to place. It’s one of those stores that you visit when you’re looking to do most of your shopping in one place. They basically have it all including food, clothing, furniture, and most household amenities. However, even though many of the items there are fairly inexpensive, when you finally bring your cart up to the cash register, your final bill can still end up being quite high. Fortunately, there are a number of good ways to save money whenever you shop at Target. Below is a list of some of the tricks and tips that you might want to try the next time you are shopping there to reduce your overall bill. First, always check the end caps. Those are the shelves at the end of the aisle. Sometimes they contain clearance items that the store is trying to get rid of, or sometimes they contain the weekly sale items. The best sales or deals will usually be found on the end caps. Coupons will always help you save money and Target accepts manufacturer’s coupons for both regular priced and sale items. So if you already scour your Sunday papers looking for coupons, you’ll be happy to know that Target accepts them. Did you know that Target has a section of their website donated to in-store coupons? If you didn’t, make sure to check out coupons.target.com to see what great deals you can score, or visit Coupon Sherpa to get a discount code for Target. The best thing about Target’s store coupons is that they work on sale items and you can use them with a manufacturer’s coupon. Just image how much money you could save on one item that’s on sale if you have both a store and manufacturer coupon! Have you ever purchased an item only for it to go on sale a day later? It’s frustrating, right? Luckily, if you have the receipt for the item, Target will refund you the difference for the week that it’s on sale. Of course, this won’t work for an item you bought a month prior to the sale, but if you bought it anywhere from a few days to a week before, you should be golden. Unlike some stores, Target does offer a price match guarantee. This means that if you have WalMart’s weekly ad and they’re offering an item for a few dollars cheaper, Target will grant you that price. It’s definitely worth it to keep your eye on the sales ads because this is a great and easy way to save a few dollars. Have you ever noticed that some businesses charge more for online items than they do for their store equivalent? For instance, a particular piece of clothing might be marked as $9.99 in the store, but as $11.99 online. Unfair, isn’t it? It’s best to watch these prices so you know when you should buy something in person or online. Additionally, watch out for the store and online prices, too. Sometimes online items will have a higher percentage off because it’s assumed that more people will see the sale online. In these cases, the retailer is trying its best to get rid of the item. If you’re a savvy shopper, then you probably already know when new items go on sale and how quickly they’re marked down. Target has a regular markdown schedule, which is something you should become familiar with if you’re a frequent shopper. For instance, the markdown schedule lists when 50%, 75%, or 90% off after holiday sales begin. You wouldn’t want to miss a 90% off sale, would you? Target has their own credit or debit card called a REDcard. Signing up for this card means that you’ll save 5% off every visit and that you’re guaranteed free shipping for every online order. While 5% might not seem like a lot of money, it adds up. This is an especially great perk if you often shop at Target. After all, if you have the opportunity, why wouldn’t you opt for 5% off? Similar to a lot of businesses that are trying to be environmentally friendly, Target offers 5 cents back on every reusable bag. Again, 5 cents might not seem like a lot in the long run, but you’re still saving some money. For instance, if you have 5 bags with you for all your purchases, that’s $0.25 you’ve saved. A little saved money goes a long way. Have you been eyeing a certain TV for months? Or maybe you’ve needed a new jacket for awhile. What about a new set of luggage for your upcoming vacation? 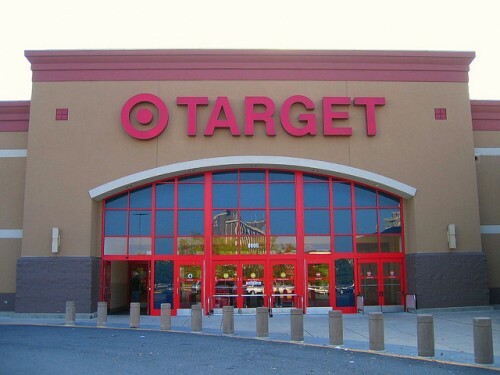 Whatever you might be looking for, you should check out Target’s Daily Deals. They’ll post around 10 to 20 small items each day as well as one big ticket item. The sale price varies depending on the item, but it’s definitely something to keep tabs on. Their big ticket sales are even listed for the week so you can know what to expect.